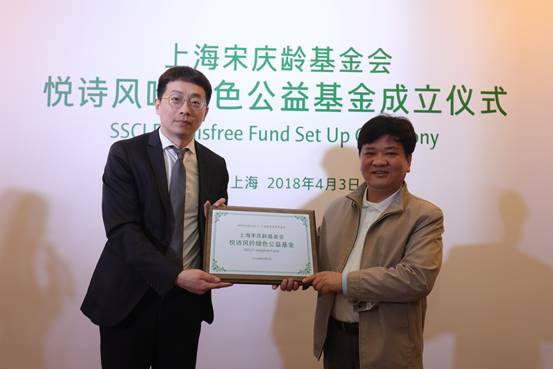 The establishment ceremony of SSCLF – Innisfree Green Public Welfare Fund, jointly sponsored by Amore Pacific Trade Co., Ltd. and the Shanghai Soong Ching Ling Foundation, was held at No. 369 North Shaanxi Road on April 3, 2018. The Innisfree Fund is committed to donate RMB 1 million yuan each year for three consecutive years. The special fund has donated the first charitable donation of 700,000 yuan. All the donation will continuously be used in the education and environmental protection projects that Innisfree has implemented in China for many years. In his speech, SSCLF’s acting secretary general, Mr. Jia Yong said Innisfree Green Public welfare Fund, as the first batch of special funds established in the SSCLF in 2018, will inject more fresh vigor for the cause of China's education and environmental protection, and become a rising star in the aspect of public welfare innovation and expanding the social influence of special funds. Innisfree general manager of China Mr. Cai Jianren said Innisfree Public Welfare Fund’s money not only came from the company, but in the future from the power of the public, attracting more people to participate in public welfare activities, contributing what they can to the cause of China's environmental protection and education.